ASUNCION — Paraguay announced on Wednesday that it intends to move its embassy in Israel from Tel Aviv to Jerusalem, becoming the third country to do so after the United States and Guatemala. In a brief statement, Paraguay’s foreign ministry said it had "begun the process of executing the presidential decision." "We are very pleased by the important decision to move the Paraguayan embassy. This decision by (President Horacio) Cartes is fair and brave," Israeli ambassador Zeev Harel told daily newspaper ABC de Asuncion. According to Israel’s foreign ministry, Cartes may attend the opening of the new embassy on May 21 or 22 – accompanied by president elect Mario Abdo Benitez, who is set to assume power in August. 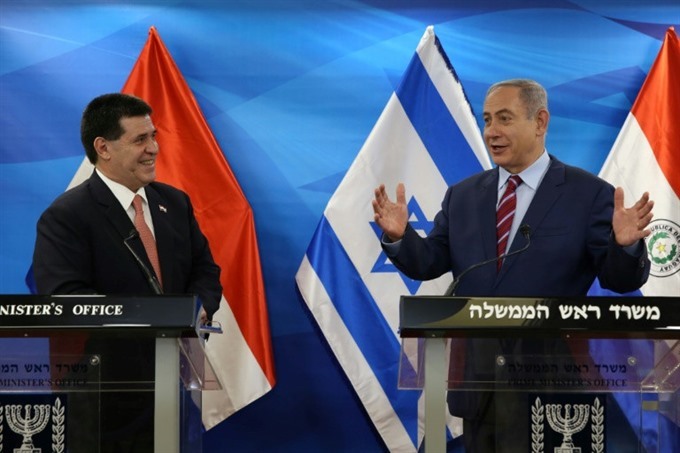 Paraguay’s announcement comes days ahead of the US embassy’s relocation on May 14, which coincides with the 70th anniversary of the creation of the state of Israel.